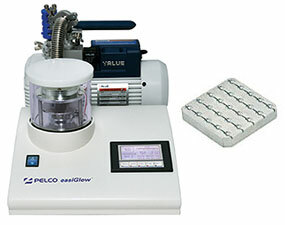 For one of the most common glow discharge applications, making TEM support films or grids hydrophilic using air, the PELCO easiGlow™ uses an automated and quick cycle with fully selectable parameters. The microprocessor controlled system also offers full manual control for all parameters and an advanced protocol programming feature for custom designed glow discharge applications. Parameters and protocols can be stored to facilitate consistent glow discharge results. Open the shipping box, plug it in, and you can start. 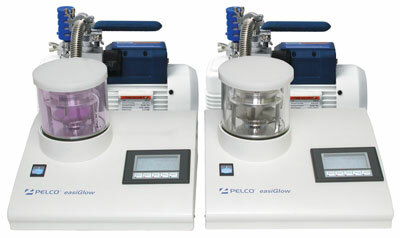 The PELCO easiGlow™ Glow Discharge Cleaning System is a compact, quick and easy to use standalone system. It is primarily designed for cleaning TEM grids and hydrophilization of TEM carbon support films, which have the tendency to be hydrophobic. A glow discharge treatment with air will make a carbon film surface negatively charged (hydrophilic) which allows aqueous solutions to spread easily. Manufactured in USA. With increasingly demanding imaging applications, using clean and consistent quality TEM grids and supports has become more important than ever. Glow discharge treatment of TEM grids removes adsorbed hydro carbons, cleaning them while making them hydrophilic. 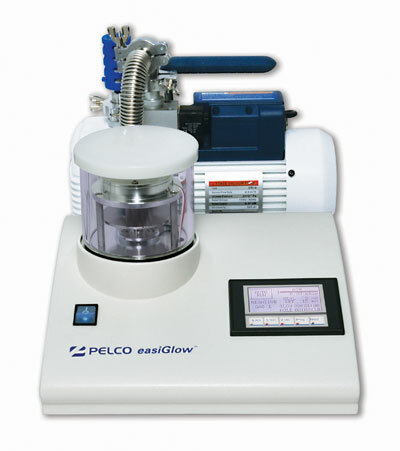 The PELCO easiGlow™ is an affordable and easy to operate glow discharge system for any TEM lab. The practical chamber size with its newly designed glow discharge head and adjustable stage with glass slide holder allows for easy loading and fast turnaround times. The system is fully microprocessor controlled and includes an intelligent touch screen device for control and display of operation parameters. The PELCO easiGlow™ supports both hydrophilic and hydrophobic treatment with either negative or positive charge and includes two separately controlled gas inlets. 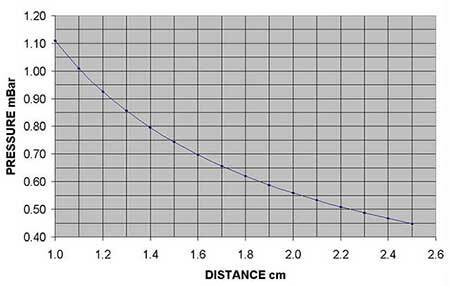 The required vacuum level is set by an electronically controlled precision proportional valve. This novel approach eliminates manual setting with a needle valve. A gentle venting procedure ensures that the TEM grids are not disturbed when the system is vented. Reference for glow discharge and use of subsequent Magnesium Acetate treatment to obtain Hydrophylic; charged surfaces: Portmann, R., and Koller, Th. 1976. The divalent cation method for protein-free spreading of nucleic acid molecules. In Proceedings of the 6th European Congress on Electron Microscopy, Vol.2, p546. Efficient glow discharge performance for the PELCO easiGlow™ with optimum pressure at given distance from sample to glow discharge head. Preprocess Hold Timer 0-14411 sec. For those labs which need both hydrophilic and hydrophobic surface treatments on a regular base, a dual glow discharge system is available to avoid cross contamination of the glow discharge chambers. Hydrophobic surfaces are preferable when organic solvents are used. For easier ordering, we have created a bundle including all items needed for a typical glow discharge setup in a cryo-EM lab. This convenient set includes, in addition to a PELCO easiGlow™ unit, a specially matched vacuum pump with all accessories, a rubber gasket to protect the glass chamber edge, as well as one PELCO® Grid Holder Block, a handy alternative to putting your grids on glass slides. The Grid Holder Block is included in the bundle free of charge, a savings of $60. 91000S NEW PELCO easiGlow™ Cryo-EM Glow Discharge Set, 115V each P.O.R. 91000S-230 NEW PELCO easiGlow™ Cryo-EM Glow Discharge Set, 230V each P.O.R. 91000 PELCO easiGlow™ Glow Discharge Unit each P.O.R. 91002 Dual Chamber PELCO easiGlow™ Glow Discharge System each P.O.R. 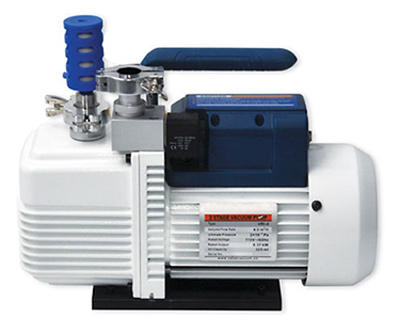 Since the optimized vacuum level for glow discharge procedures is in the range of 0.45 to 1.1 mbar, we offer the affordable GD4 dual stage rotary vacuum pumping system, designed specifically for this pressure range. Weight 11kg / 24 lbs. 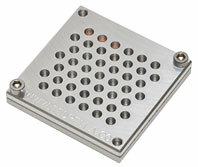 Two sizes available: 25 TEM grids in 5 x 5 matrix and 81 TEM grids in a 9 x 9 matrix. 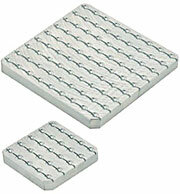 Holds 45 grids securely clamped between two plates.